For the third straight year, Bohs dumped Longford out of the EA Sports Cup and booked their place in the second round. In a repeat of last season’s scoreline, tonight’s encounter ended with a 3–1 victory for the Gypsies, with goals coming from a Peter McGlynn own goal, Derek Prendergast and Jake Kelly for the hosts, and David O’Sullivan netting for the travelling side. The home side picked a relatively strong starting line-up despite having played 4 games in 14 days, but Keith Long saw tonight’s game as an ideal rest a couple of players including the front two of Mark Quigley and Kurtis Byrne, who impressed last time out against Wexford Youths. Bohs stormed into a 1-0 lead after just three minutes in yet another frantic start at Dalymount Park. A beautiful, in-swinging free kick from left back Lorcan Fitzgerald was diverted into his own goal by the helpless Peter McGlynn. Almost instantly the visitors found themselves back on level terms straight from the resulting kick off. A long hopeful ball straight through the heart of the Gypsies backline ran through for David O’Sullivan who drilled the ball low under Dean Delaney to level things up. Another blow was to come for the home side when Ismahil Akinade, who seemed to have the beating of the Longford defence, was forced off injured after just 16 minutes on his return from suspension. Longford then had a glorious chance to go 2-1 up after some great work down the right wing, ever threatening Peter McGlynn, cut back to skipper Kevin O’Connor and his right footed shot rifled off Delaney’s bar, bouncing down but somehow not crossing the line. With both teams conceding possession a bit too easy for their liking, the game became scrappy and also a little feisty. Adam Evans and Pat Flynn had an off the ball tussle resulting in both going into the book. Right on the stroke of half time Bohs then had their chance to take the lead. A cut back from the end line fell to Adam Evan who fluffed his lines with the goal at his mercy after the ball took a nasty bobble on its way across. Bohs started the second half the better side, grabbing the game by the scruff of the neck with two quick-fire goals. Another excellent dribble from Ben Mohammed drew a nasty foul from John McKeown, who received a yellow for his efforts. Up stepped left back Fitzgerald, and with his wand of a left foot, crossed from the left wing. The top class delivery was delicately glanced in by Derek Prendergast to make it 2-1 in the 48th minute. Just five minutes later, the home fans were celebrating wildly once again when, that man again, Fitzgerald, whipped in an out swinging corner that caused all sorts of havoc in the visitors defence and the ball was eventually scrambled over the line by Jake Kelly. From then on the hosts looked in control, keeping the ball much better than in the first half. Gypsies boss, Long, deserves a lot of credit for pushing Ben Mohamed into the number 10 position where he was able to see more of the ball and become a constant thorn in the side of Tony Cousins’ men. Langford’s frustration got the better of them when with just 10 minutes left to play, Pat Flynn hacked down Bohs substitute Patrick Kavanagh after his cross field dribble came to an abrupt end, resulting in the defender receiving his second yellow and marching orders. The home side saw out the game comfortably enough and will be more than delighted that the defensive errors that plagued them in recent games seem to be coming to an end which will delight boss Keith Long. Next up is a tricky away tie to Galway on Saturday but the Gypsies will go into the game full of confidence now they are back to winning ways. 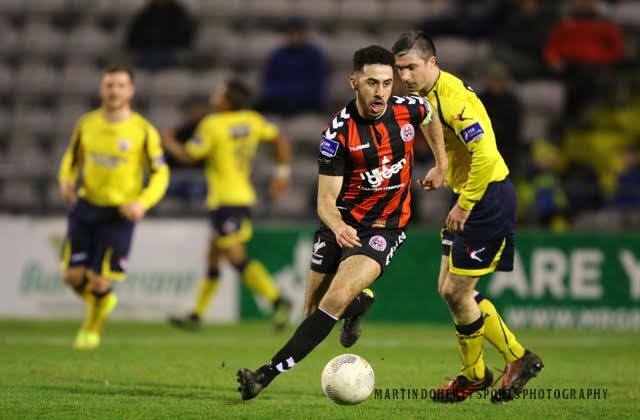 Bohemian FC: Dean Delany; Lorcan Fitzgerald, Daniel Byrne, Derek Prendergast, Dylan Hayes; Adam Evans, Keith Buckley (James Kavanagh 78), Roberto Lopes, Aymen Ben Mohamed (Jason Caffrey 84); Ismahil Akinade (Patrick Kavanagh 16), Jake Kelly. Longford Town: Ian Molloy; Jamie Mulhall, Daniel O’Reilly, Pat Flynn, Mark Hughes; Kealon Dillon, Peter McGlynn (Kaleem Simon 58), Kevin O’Connor (Philip Gannon 84), John McKeown; David O’Sullivan, Karl Chambers (Josh O’Hanlon 63). Booked: Pat Flynn (38 & 81), John McKeown (48), Daniel O’Reilly (82).